Cort Guitars knows that sophisticated players are serious about their tone. With each addition to the Artisan line of electric bass guitars, Cort offers excellent workmanship and world-class materials to meet high expectations. Cort’s new five-string A5 Plus SCMS model follows this tradition by offering a new take on premium wood tones and a new-to-series multiscale design. The combination of these features, along with premium electronics and hardware, offers players a sleek bass guitar with excellent depth and range. The A5 Plus SCMS’ Multiscale form the foundation of this 34’’ to 35.5’’multiscale instrument. This design modification and a corresponding single-string hardtail bridge improve tension and enhance the tonal response of each string. The A5 Plus SCMS also incorporates the series neck-thru-body construction that allows strings to vibrate across the neck and body in a coherent, linear manner, maximizing tightness of the low-end with rich mids and singing highs. Tonal balance is also achieved with the A5 Plus SCMS’s high-quality materials. The lightweight yet solid Swamp Ash body with spalted Maple top provides a strong, fundamental low-end resonance and a clear high-end. This complements the high-midrange and treble of the 5-piece Maple and Panga Panga neck. The exotic Panga Panga is also used on the 24-fret fingerboard, and strong Walnut is used for binding. Cort allows these materials to shine both sonically and esthetically with OPN (open-pore natural) and OPTG (open-pore trans grey) finishes. Platinum hardware adds a rock-steady flair while Hipshot Ultralite Tuners result in 30% weight reduction over regular tuners and improved balance and tuning accuracy. Like other Cort Artisan basses, the A5 Plus SCMS is equipped with Bartolini electronics. 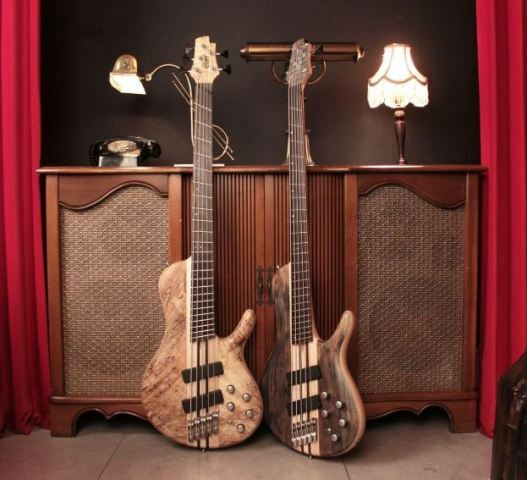 Bartolini MK-1 pickups deliver a superbly balanced sound, while the corresponding Bartolini MK-1 preamp provides a powerful yet transparent boost along with a trademark crisp high-end. The MK-1 transfers the bass’s natural liveliness through a flexible 3-band equalizer for a variety of applications ranging from studio recording to large concert halls. It also provides a switchable active/passive mode for a powerful, modern active sound or an organic, traditional passive sound.